Announcements - The Calumet Players, Inc.
February 2nd, 3rd and 4th at 6:30 PM at the Schoolcraft Township Office in Lake Linden. You are invited to attend the 2014 Calumet Players Annual Meeting. Time: Dinner off the menu at 6 p.m. with the meeting starting at 7 p.m.
Cinderella opens THIS Thursday! 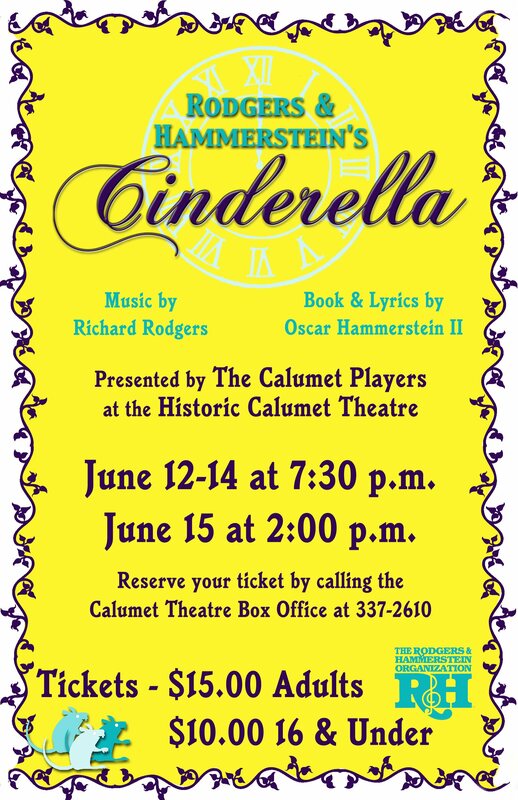 Reserve your tickets now at the Calumet Theatre Box Office! (906) 337-2610. Funding from the Michigan Humanities Council and the Keweenaw National Historical Park Advisory Commission has made it possible for the Calumet Theatre to produce an original play in commemoration of the one hundredth anniversary of 1913-1914 Copper Miners Strike. Playwright Steve Feffer has been commissioned to write the new play inspired by this landmark historical event. The play, entitled Strike Parade, is set in the Calumet Theatre primarily on December 23, 1913, and focuses on the Women’s Auxiliary #15 of the Western Federation of Miners, including member Anna “Big Annie” Clemenc. The play tells the story of this diverse group of women as they prepare with humor and resourcefulness for the Christmas party at the Italian Hall on the following evening under the harsh conditions of their life during the strike. While the play is non-fiction, it draws on historical characters, archival material, newspaper accounts and period songs to bring to the stage a group of women that are committed to sharing with their community a desire for respect and dignity, as represented by the daily “strike parades” that became a regular feature of life during the era. At the heart of the play is the relationship between “Big Annie” and a reporter from a newspaper in Denver, new to the town, who may or may not be a labor spy. Playwright Feffer, is a professor of playwriting at Western Michigan University in Kalamazoo, whose plays been seen in Michigan, including the U.P. Book Tour and Kalamazoo, as well as Chicago, New York, Houston, Philadelphia, and other theatres around the country, and published by Best American Short Plays, Applause Books, Dramatists Play Service and Faber and Faber. The play is directed by Patricia Helsel, Associate Professor of Theatre at Michigan Technological University. Helsel’s most recent play is the Tech Theatre Company’s Rose and the Rime currently showing at the McArdle Theatre at MTU. Auditions will be held on February 19, 20, and 21 at 7 pm at the Calumet Theatre. Please come prepared to read from a script. Though Strike Parade is not a musical, it may include some group singing. Be prepared to sing a few bars of a familiar tune. Actors are being sought for the following roles: Annie Clemenc, age 25; Kathryn, a reporter, age 25; James “Big Jim” MacNoughton; Coleen, his wife; female actors for the Western Federation of Miners Women’s Auxiliary Local #15; male actors - playing a number of the other roles in the play, including Charles Moyer, Joe Clemenc, various townspeople and workers. Strike Parade is scheduled to open at the Calumet Theatre on April 25, 2014. Please call the Calumet Theatre at 337-2166 or email busoffice@calumettheatre for additional information. Help us get the building cleaned and ready for spring set construction! Please plan to attend our annual meeting. Please call or email Debbie Manderfield to reserve your spot. NAMED cast members of Seussical...Please bring a $15 dollar deposit for your script. This money will be refunded to you when your script is returned in good condition. Thanks.